Draw in the major plate boundaries on the World Ocean Map. Indicate with arrows the direction of plate motion at each. Determine the distance to the epicenter from all 3 locations, then plot the location of the epicenter on the map. 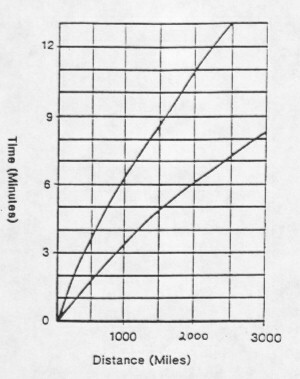 Note: Use the Time-Distance graph below (not the one in the lab book) to determine your distance to the epicenter. Draw and label the artesian-pressure surface on Figure 9-3 (p. 263).